December 10, 1908 -- Herriman pithily condenses boxer Abe Attell's recent problems into a delightful kat comic strip. Here's some annotation: Atell has fought Owen Moran twice in the past year, and both times he came away unsatisfied with a draw. Looking to put one in the 'W' column, Attell then set his sights on Freddie Welsh -- only to come away with a rare loss. Trying to get back on track after a miserable bunch of fights, Attell is now slated to fight Abe Wolgast tomorrow night. The bad news is (I'll tell you since Herriman did not do a cartoon on the subject) that Abe Wolgast, too, will eke out a draw against the struggling Attell. Abe Attell will wisely look for greener pastures after tomorrow's fight. He will spend pretty much the rest of his career on the east coast circuit, putting together a much healthier record. OMG. I got your book on IIL and what a massive amount of information. I am going to have to buy my own copy. I am sure you can't even come close to all the hours that went into the production of this excellent reference book. Thanks for everything you do. Thanks Carolyn, comments like that make it all worthwhile. This undated divided-back postcard by Clare Victor "Dwig" Dwiggins, is from a series called School Days, aka Series #170, by Raphael Tuck. 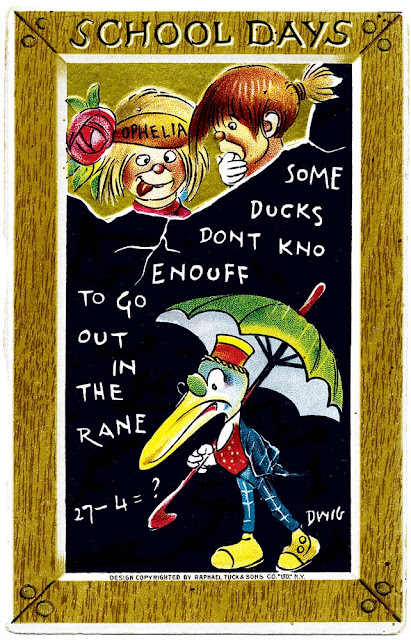 These postcards were of course based on one of Dwig's most enduring newspaper comics series, School Days, which was popular in various guises and titles from 1909 through the 1920s.The one constant in these newspaper comics was Ophelia, the little girl with the protruding tongue, and her school slate, on which she wrote funny sayings. The postcards use this motif and add some high-end features -- embossing and shiny gold ink -- to make a very attractive package. This particular example was never used. You've run several of the "School Days" in the past. A central gag is the beautiful teacher ignoring the students while the smitten three-man school board hangs around her. She was a caricature Gibson Girl, with gigantic hair and flowing dresses. You mentioned the strip lasting into the 20s. Did she adapt to Jazz Age fashions? Do you have any samples? Smitten readers want to know. If you can, please post the back of the postcards as well. That can often give important information about the card - how it was distributed, who produced it (not always the copyright holder) and for a used card, a date. The later Dwig series (then known as School Days of Tome Sawyer and Huckleberry Finn) did not generally feature the beauteous teacher, I'm sorry to tell you. I would be delighted to do that, but these are old scans I made years ago, and the actual postcards are buried somewhere in deep storage, currently unavailable. I only have basic info about the reverses because I jotted down a few notes at the time. Virginia Huget makes one of her unfortunately scarce performances handling art as well as writing on the cover series Campus Capers. The story about a military school romance is anything but memorable, but I do so enjoy her jaunty and playful fine-line style. Her writing talents were in enough demand that her considerable drawing ability was far too often back-burnered for my money. 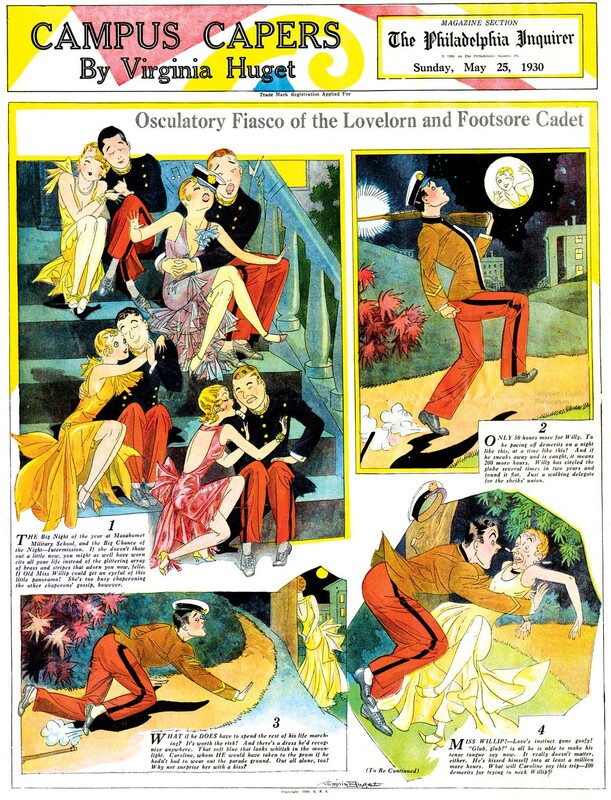 Campus Capers, distributed by King Features Syndicate, appeared on magazine covers from April 20 to June 22 1930. 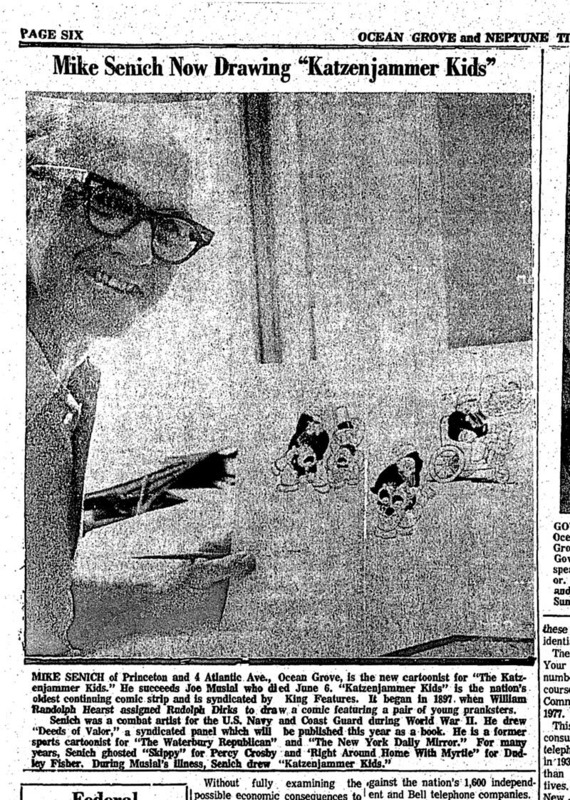 Mike Senich was born Michael Robert Ksenych in Waterbury, Connecticut, on December 3, 1912. The birthdate is from the Social Security Death Index. The birthplace is from the Social Security application which had the birth year as 1913. The surname, Ksenych, is from the 1920 U.S. Federal Census and 1935 Waterbury city directory. On the Social Security application, the surname was spelled Ksenich. The middle name was found in a 1949 copyright entry. In the 1920 census, Senich was the sixth of nine children born to Onufer and Anna, both Austrian emigrants. The family resided in Waterbury at 88 Hill Street. The address was the same in 1930. Senich began his artistic career in his home town of Waterbury, Conn., while he was still in high school. An avid sports enthusiast and baseball player, he freelanced sports cartoons to the Waterbury Republican. He continued to work full-time for the Republican for two years after graduation, occasionally turning out political cartoons as well. Then came his first “good break” when he landed a job as a staff artist on the New York Mirror. The 1935 Waterbury city directory listed Senich’s mother was a widow who lived at 88 Hill Street. “Michael Ksenych” had the same address and was a watch maker at the WC Company. According to the 1940 census, Senich was a New York City resident in Manhattan at 401 1/2 East 70th Street. He was a newspaper artist who lived in the city in 1935. The Princeton Packet (New Jersey), May 15, 2006, noted Senich’s military service. 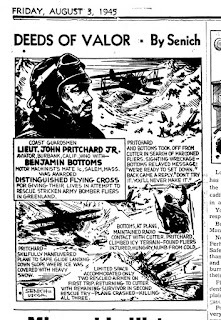 The Arts Digest, October 1, 1944, reported the National Gallery of Art, in Washington, D.C., exhibition of paintings and drawings by Coast Guard combat artists which included Senich. After the war, Senich returned to Connecticut. Who’s Who of American Comic Books 1928–1999 has an overview of Senich’s contributions. A detailed list of Senich’s comic book work is here. © Michael Senich (Mike Senich); 24Mar65; BB27904. Senich was one of several combat artist whose name was entered into the Congressional Record, June 27, 1995. The artists’ work was exhibited at the National Building Museum in Washington, DC.. The Princeton Packet said Senich retied in Florida. Senich passed away May 4, 2006, at his home in Florida, which was reported in the Princeton Packet, May 15. He was laid to rest at Brig. Gen. Wm. C. Doyle Veterans Memorial Cemetery. * note from Allan -- Deeds of Valor was indeed offered to newspapers, but it appears to me that the panels were free handouts offered by the Coast Guard. Even free, they did not seem to get much ink from newspapers, though they were very good patriotic capsule histories of Coast Guard heroes. The Sikeston (Mo) Standard ran a total of 7 panels over a period of six months in 1945, while the only examples I could find in the two other newspapers that came up in search results were single examples, obviously just run to fill a hole. 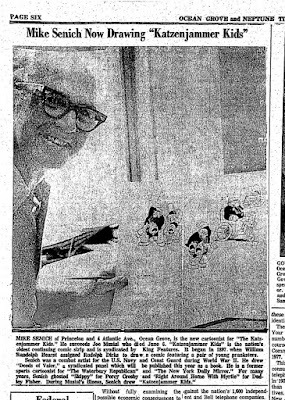 A 1960 interview with Senich has him saying he ghosted the Katzenjammer Kids for Doc Winner for two years, before taking over Myrtle "five years ago". The article reports that he joined the New York Mirror as sports cartoonist in 1936. After three years in comic books, he went into advertising. He was working in Boston advertising before joining King Features in 1951. He was living in Forest Hills in 1959 before moving to Kendall Park, New Jersey. Finally, Deeds of Valor was supposedly syndicated (given?) to over 100 papers. Seems that probably an overstatement. PS -- Senich also reported to be an uncle of Bob Crane of "Hogan's Heroes"! Fianl PS I swear -- The Oct 10, 1945 "They'll do it every time" by Hatlo gives 'thankx" to Mike Senich, USCG. What is a poor turn-of-the-century newspaper cartoonist to do once all the good ethnic groups have been taken, and you can no longer get away with doing a 'me-too' strip making fun of the accents and foibles of the Irish, Germans, Swedes, Italians, blacks, Asians, etc? Maybe you come up with an idea that's genuinely humorous and doesn't make fun of someone based on their skin color or national origin? Nah. John R. Bray's solution to that tough problem was to look to other conditions that can be ridiculed. Hey, how about stuttering? Why that's absolutely hilarious! Thus was Stuttering Sammy, or as it was often written in the heading, S-St-Stut-tering Sa-Sammy, born in the McClure Sunday comic section of June 17 1906. The gags were exactly what you might expect -- Sammy needs to tell something important (or not important, as in the sample above) but can't get it out in time. Mayhem ensues. Although I condemn Mr. Bray for picking on stutterers, I must admit that he actually tried to redeem himself on the issue. Starting with the episode of May 19 1907, he had Sammy realize that he could manage to get out his important messages if he would sing them -- this is actually a pretty common solution for stutterers to work around their affliction. 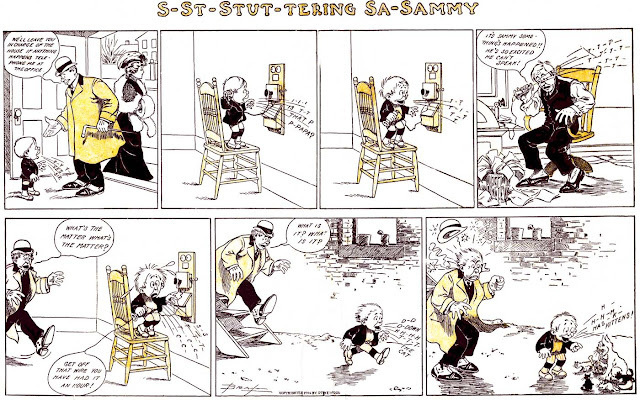 The strip was retitled Singing Sammy, and the gag became that little Sammy had to belt out a song in order to communicate. Apparently this gag wasn't nearly as effective as the stuttering material, because Bray ended the series shortly after (or his one-year contract for producing the strip ran out). The final episode was run on June 23 1907. Thanks to Cole Johnson for the sample strip. Mocking people's differences seems to have been a keystone of late 19th / early 20th century popular culture. A number of old songs picked on stutterers. The only one to become famous was "K-K-K-Katy" recorded in 1918 by Billy Murray. The record includes a sketch in which a stuttering soldier tries to romance his girlfriend while his army buddies taunt him. It was a huge hit (#3 on the charts!) and was later covered by Porky Pig. Apparently "Stuttering" comedians were a longstanding tradition on the music hall/vaudeville houses for a long time. Joey Frisco was a top star a hundred years ago famous for his stuttering singing and joking. If you're an old film fan you may recall Roscoe Ates and Tom Dugan, who did stuttering acts for many years, though both dropped it when it became passé. I guess the last of this cohort was Porky Pig. The stuttering song form was revived (a tiny bit) by Roger Daltrey on "My Generation". Love the song, but could never understand the reason for the stuttering. Carl Ryman was born Carl Adolph Reimann Jr. on May 10, 1903, in Milwaukee, Wisconsin. His birth information is from the California Death Index at Ancestry.com. Ryman’s birth name was found in his father’s biography from the book, German-American Artists in Early Milwaukee: A Biographical Dictionary (1997). Reimann, Carl A., b. 3-13-1873 in Milwaukee, d. 12-17-1937 in Milwaukee. Muralist, religious painter, and designer of stained glass windows whose name is sometimes given as Charles A.F. Reimann. The son of a Swiss immigrant father and German immigrant mother, Reimann grew up in Milwaukee and was educated in Lutheran schools. He was a pupil of Richard Lorenz and later studied at the Weimar Art School under Max Thedy (1858–1924)….Reimann’s name appears in Milwaukee city directories from 1891 until his death, his occupation being variously given as artist, designer, and craftsman in stained glass. His church decoration firm, the Carl A. Reimann Company, went under during the Depression….Reimann’s son, who spelled his name Carl Ryman, was a cartoonist and gag writer living in California. The 1905 Wisconsin State Census recorded Ryman and his parents “Karl”, an artist, and Sarah in Milwaukee. In the 1910 U.S. Federal Census, Ryman, his parents and brother, George, lived at 844 Fourth Street in Milwaukee. Ryman’s father was producing art glass works. On September 11, 1918, Ryman’s father signed his World War I draft card which had his address as 914 Island Avenue, Milwaukee. The 1920 census said Ryman was a Milwaukee resident at 168 Wright Street. Presumably, Ryman was educated at public schools. Ryman was married with three children in the 1930 census, which said Ryman was 21 years old when he married Edna. The family resided in Milwaukee at 1679 4th Street. Ryman was a designer of art glass. According to the 1940 census, Ryman’s widow mother was the head of the household which was in Milwaukee at 116 East Wright Street. Ryman was the proprietor and designer of a stain glass studio. He had attended college for three years. Some time after the census, Ryman moved to California and changed the spelling of his surname. Information about Ryman’s training as a cartoonist has not been found. According to American Newspaper Comics (2012) Ryman produced the strip, Alfred, for the McClure Syndicate. Alfred debuted October 17, 1949 and ended in 1954. The Alfred character was developed by Foster Humfreville who produced the panel for Collier’s starting in 1942. Several Alfred panels can be viewed here. Additional information about the panel and Humfreville is here. Humfreville was a California resident and may have known Ryman. The Catalog of Copyright Entries, Third Series, Volume 5, Parts 7–11A, Number 1, Works of Art, etc., January–June 1951, listed three cartoon characters by Ryman. The following year, Ryman and his wife, Edna, received copyrights on two cartoon characters. Ryman illustrated a BarcaLounger advertisement in the December 1952 issue of Esquire. …Mrs. Reimann, the former Sarah Geiger, died Monday of a heart attack at St. Mary’s hospital. She lived at 116 E. Wright st. Her husband, who died in 1938, operated the Carl A. Reimann Co., which specialized in church decoration. Their son, Carl, jr., Peshua Tree, Calif., is a comic strip artist. 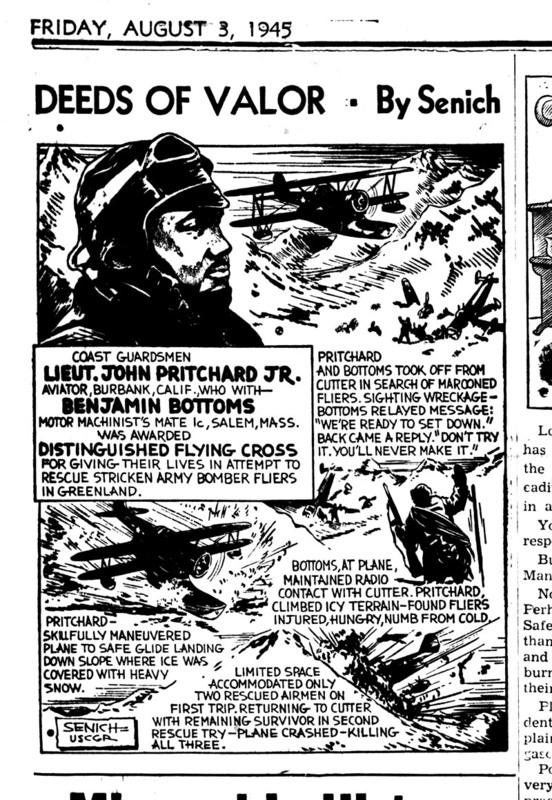 His strip, “Alfred.” formerly appeared in The Milwaukee Journal Green Sheet…. Ryman passed away September 23, 1963, in San Bernardino, according to the California Death Index.